Simple was supposed to be the online bank without the headaches of IRL banking. But three years after it was acquired by a stalwart of European finance, some customers say the company is no longer living up to its name. Customers of Simple — the 21st-century bank with no branches or checkbooks, just a website, sleek interface, and debit cards — signed up because they wanted banking to be just that: simple. But after European banking behemoth BBVA Compass acquired Simple for $117 million three years ago, customers say the process of transitioning their accounts to the new bank has been rife with headaches and complications. And for Simple customers who were not US citizens, the transition wasn’t initially possible at all. To integrate with BBVA, Simple had to rebuild its banking system, which took two years, according to a company spokesperson. When that process was complete, Simple began the process of transferring individual accounts from Bancorp, which previously backed Simple, to BBVA. This transition requires customers to provide multiple pieces of identification, transfer funds, and reconfigure features like direct deposit or autopay. Despite Simple warning customers of the pending transition back in April 2016, things didn’t go smoothly for everyone. 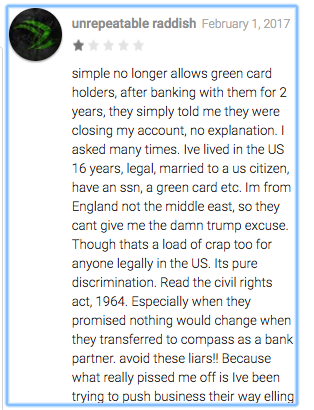 Dunn couldn’t say how many immigrants have returned to Simple since the fix was made, but the overall number of non-citizens using Simple is very small. However, plenty of people had other problems. Neil Robertson of Denver opened a Simple account after a bad experience at Wells Fargo. Because he’s a musician who’s often paid in cash, Simple’s lack of branch locations can be annoying for him. But not as annoying as when his Simple debit card recently got declined at a bar despite him having plenty of money in his account. "[Simple was] pretty exciting, but they were acquired and things seemed to stagnate." "It wasn't just my card getting declined, which is always a weird feeling, but when I pulled up the app, I had to expose what's in my account to show it to [the bartender]," Robertson said. "And every time you keep swiping that card, my account is saying it's going through — $22, $22, $22." Robertson didn’t ultimately lose any money, though he says he’s still waiting for “several hundred dollars” to show up in the new account. 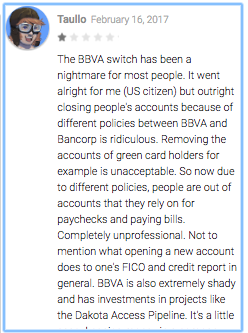 Robertson transitioned onto the new BBVA-backed Simple platform in late January, but as of yet, his old account hasn’t closed; for him and other customers, this awkward transition period has caused confusion — it’s unclear which account actually holds their money. Robertson says he’ll keep his Simple account until he can find a better option, but not everyone else is as patient. One woman said she quit Simple after suddenly being unable to use her debit card while travelling abroad. Another woman said she was temporarily cut off from her funds after her account was closed without sufficient warning as part of the transition process. And other customers are having problems with automatic bill payments still being withdrawn from their old accounts. Hey @simple the move to BBVA cost me $30 because of "insufficient funds" paying my credit card... yet the transaction went thru. What gives? Simple says it “can’t speak to specific customers’ accounts or issues for security reasons” but described many of these complaints as one-off issues. A spokesperson pointed to tweets from people who praised its handling of the transition, and said the majority of feedback has been positive. And indeed, it seems like a lot of customers are happy with the service; even some who initially had a problem with the transition will be sticking with Simple. But the challenge for Simple, which is owned by a big bank, will be retaining the customers who came to it to get away from big banks. @gordon1470 @simple's transition has been a disaster from moment one. I knew they were gonna tank when they got bought. This isn’t the first time Simple has faced this problem — some of its customers are also frustrated by the fact that BBVA Compass is one of more than a dozen banks invested in the Dakota Access Pipeline. Though Simple says it "neither financially nor philosophically” supports the pipeline, the issue serves as another example of how a big bank isn’t what Simple customers signed up for. For Aaron Shekey, the real sign of trouble with Simple came after he transitioned accounts, when he (and thousands of other Simple users) received a marketing email from BBVA about a Valentine’s Day promotion. Simple had told their customers that BBVA would never contact them. What is this garbage, @simple? Simple sent an email to customers apologizing for the mistake, and said in an email statement, “We had put agreements in place up-front to prevent this sort of cross-marketing from happening, and we’ve all been working to make sure that’s the case moving forward.” But another Simple customer, Ben Lopatin, is still worried. “Now I’m not sure what other data BBVA has access to and ‘isn’t supposed to use’,” he said via DM. "They aren't going to be 'simple' to use anymore. If anything, BBVA is probably going to ruin this." Simple always expected it would lose a few customers in the transition process, but so far, with 87% of accounts moved over to the BBVA platform, it says it hasn’t lost a significant amount of business. The company says it’s grown 68% in the last year, and has around the same number of accounts as a bank with 1,010 branches, with just a fraction of the corporate overhead. Still, BBVA has lost money on its investment in Simple every year since the acquisition, with the total write-down in value since 2014 totaling $89.5 million, according to the Houston Chronicle. In a statement to BuzzFeed News, BBVA said valuations for tech companies are “very volatile." "As with most investments, return is delivered in the medium to long term,” the statement continues, “and BBVA Compass remains committed to Simple and its continued success and ongoing growth." Also still committed to Simple is Sean Ferguson, a customer who plans to keep his account despite what he calls “completely irresponsible” behavior, because it still makes it easier for him to manage his money. I’m sorry. Just feel so betrayed. @simple was my partner. The way they viewed banking helped my finances so much! Now it’s just a bank.